A beautifully-carved stone plaque attached to the wall of a single-room extension built onto the south-west end of the early 18th century St Colman’s church in Farahy, County Cork. 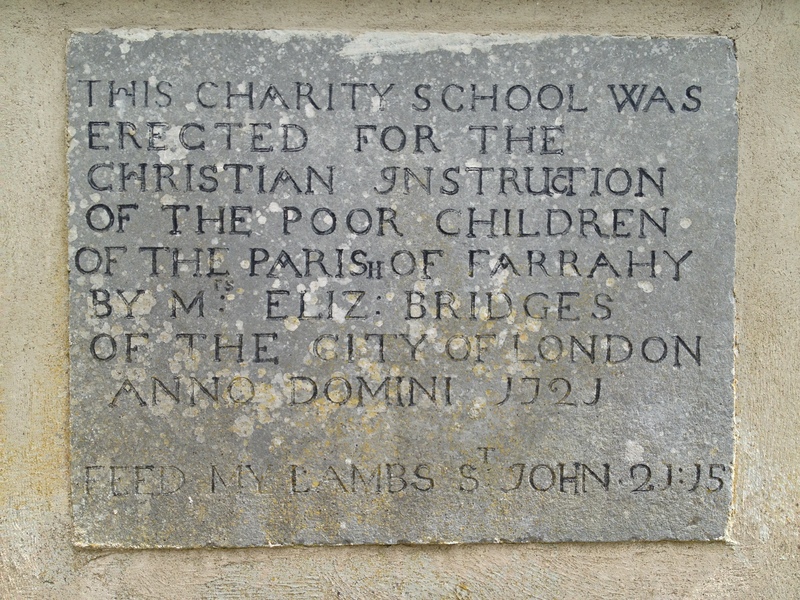 As Charles Smith noted in his survey of the county (published 1750) this little structure served as ‘an English Protestant school, with an acre of land set apart by virtue of the statute for the education of poor children in the Protestant religion.’ Perhaps because of its diminutive size, the school does not seem to have lasted long: by the time Nicholas Carlisle produced the Topographical Dictionary of Ireland in 1810 there was no mention of it in the entry on Farahy. One longs to know why Mrs Elizabeth Bridges of the City of London had chosen to endow such an establishment in this part of Ireland in 1721. Farahy today is best-known as the parish beside which stood Bowen’s Court, ancestral home of Elizabeth Bowen which was sadly demolished soon after she sold the estate in 1959. This entry was posted in Architectural History, Cork, Irish Cottage and tagged Architectural History, County Cork, Farahy, Georgian Architecture. Beautiful. I wish your friend well.